Classic LifeCare nurses are using their talents to serve people who wouldn’t otherwise have access to foot care nursing. 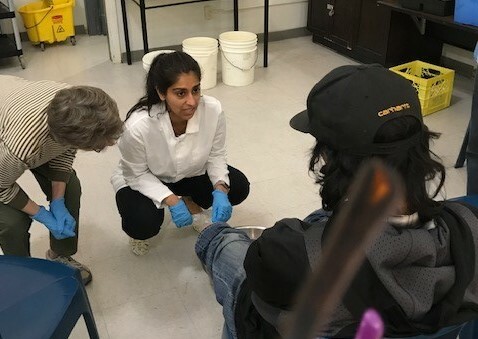 Susan Fulton, Classic LifeCare’s Clinical Leader, says she and Clinical Nursing Supervisor, Simi Banipal, volunteer every eight weeks providing foot care nursing to people at First United Church in Vancouver’s downtown east side. “One fellow came to see us at First United because he got himself a job two days a week and wanted to make sure his feet were healthy so he could stand for an eight-hour shift. So he wouldn’t be in pain,” says Susan. This initiative started about a year ago when Classic was approached by community partner Evergreen Nursing to partner with the First United Church of Canada to provide Foot Care Nursing to those in need. 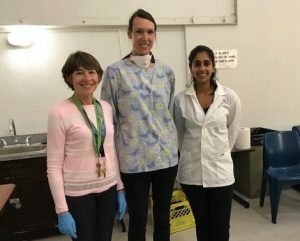 Elizabeth Kerklaan, who has volunteered for almost 10 years at the foot clinic at First United and is now on the board, says this foot care service is unique in Vancouver’s downtown and incredibly important for the people accessing it. Elizabeth says she reached out to try to get some foot care nurses on board over a year ago and their expertise has been incredibly beneficial for the community they serve. Elizabeth says people are glowing after their foot care treatment and one woman said she felt like a queen. If you want to help support this foot care initiative, donations of socks, Epson salt, tea tree oil, Band-Aids, Polysporin, and money can be made by calling Cristien Donhuysen at 604-681-8365 x129 or email cdonhuysen@firstunited.ca. Visit the website at https://firstunited.ca. Donations can also be made via Classic LifeCare, which will be delivered to First United by Susan and Simi. Pictured above: Elizabeth, Susan and Simi during a Tuesday foot care clinic. Before Susan became a nurse, she travelled abroad and spent some time volunteering to help homeless people. Classic LifeCare’s Vancouver, Comox and Edmonton branches provide foot care nursing for clients, along with a complete home care service offering. Promotes healthy feet and awareness. Referrals to other health professionals. For more information or to book a foot care nursing visit, call Classic LifeCare or visit www.classiclifecare.com.